It was a Monday morning shortly after the Ann Arbor News announced it was shutting down print operations. On Ann Arbor radio station WTKA-AM, host John Bacon was on the air. Inside the studio with him was Sports Illustrated media writer Richard Deitsch. Deitsch was at Michigan participating in an almost year long fellowship program. The two were discussing the sports news vacuum that the closing of the newspaper would create. On the phone, they had University of Michigan Sports Information Director Bruce Madej. What happened next was unexpected. In the middle of the discussion, Deitsch asked Madej point blank: "Are you going to credential mgoblog.com?" After a short pause, Madej said "Yes." In a telephone interview, Deitsch said that he was not totally surprised by the response. "Bruce has been pushing his department to expand the envelope," Dietsch said, "and he as always been open-minded. But something else totally unexpected played into this whole scenario. While Deitsch was on the air with Bacon and Madej, Brian Cook was sitting outside the studio waiting to go on for a segment. Who is Brian Cook? 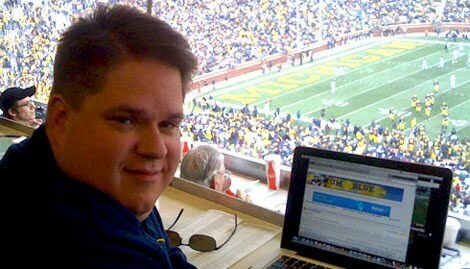 He is the owner and publisher of mgoblog.com. He was shocked when Dietsch as the question and said he thought that he "was being mischievous", but was very happy with the response. Cook is very humble when talking about mgoblog.com, despite the fact that he got 130,000 unique visitors and over 3.5 million page loads last month. "I started the blog in December 2004 with no real grand design for it," said Cook. "By 2006, I was getting 2,000 page views a day. AOL Fanhouse came along and I took an offer to be the lead football blogger. As a result, my traffic kept going up." Cook merged his blog with a blog done by University of Michigan students. In 2008, Madej asked him if he wanted to be credentialed and he said no. "I didn't think it made sense at the time, and I still am not sure it makes sense for me," said Cook. "I am not a journalist and have not been trained as a journalist." Does he get a lot of resentment from the beat writers? "Not all all," he replied. "In fact I have al lot of respect for beat writers who do it well. But what makes me different is that I am able to do a lot more analyses and have a better position in the fan base." Cook also said he was initially surprised when Madej approached him, as he had always seen Michigan as being leery of things like blogs and pushing the envelope. So this summer he decided to take the dive and see how it worked out for him. This all sounds very good for someone living with mom and typing his blogs in the basement while where pajamas, right? Oh wait, they is the stereotype that blog-haters like to portray. The reality is that Cook actually is able to earn a living off of this blog, and he is making money while beat writers are losing there jobs. One reason Cook has done well is because he was an early entrant into the sports blogosphere. This allowed to him to gain and hold a strong position. And once a web site has that position it is hard for anyone else to catch up. This is an application of a principle called Zipf's law, according to Phil Callihan who publishes umgoblue.com. University of Michigan sports. Photo courtesy of Phil Callihan. "What Zipf's Law says, as applied to Internet rankings, is that the number 1 web site in a given category will get 10X the traffic of the number 10 site and 100X the traffic of the number 100 site," said Callihan. Bit this has not stopped Callihan from taking on coverage of Michigan sports. Callihan became interested in covering sports when he was just 10 years old, and he has always watched how media covers things. Callihan says that he would be writing even if he did not have credentials and that he is in it for the long haul. He also feels it his approach to his blog that gave it credibility in Madejs eyes. ""We may not be the biggest blog," said Callihan, "but I have a track record of fairness and a policy of reining users in when they post comments, and they are very reasonable fans who will not take cheap shots. This has helped Bruce see me as a reliable partner that was trustworthy." He adds that "Bruce is very progressive in his thinking. He is always seeking input and is looking forward, trying the blaze a trail for the future. What I am trying to do is leverage new media in ways old media should have been doing all along. I am always looking to engage people in new ways." This last statement is very telling about Callihan's approach because by day he is the director of information technology for a private company. Like Cook, he respects the print media and they have been great to him. In addition, he sees ways that he can even bring a value add to the athletic department. So as you sit at home and watch tomorrow's Big Ten battle for bragging rights, keep in mind that sitting among the old media journalists in the press box will be these two bloggers. They are there because they do what they do well, and didn't let pre-conceptions hold them back.